HABIT: White flowers on a large raceme from summer to fall. Drooping berry clusters from late summer through fall. Several stalks, with smooth bright red to purple bark. Large smooth green leaves. Small red berries turn purple when ripe; their juice leaves a red stain. CULTURE: Likes rich moist soil but will grow anywhere in Texas except the far west. USES: Bird attractant. Pot herb that tastes like spinach. PROBLEMS: Deadly poisonous if not carefully prepared. 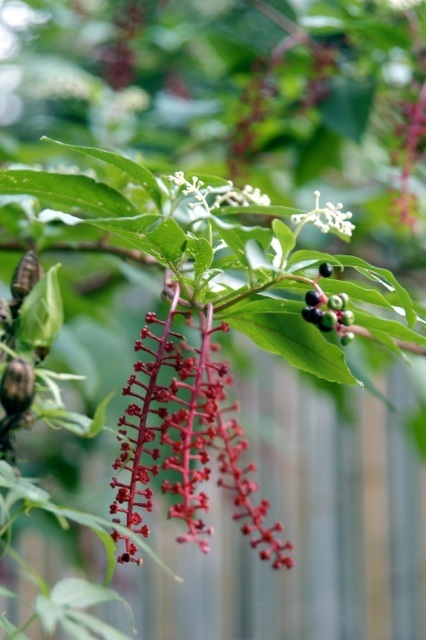 NOTES: The berries, bark, and older leaves contain a very toxic alkaloid. 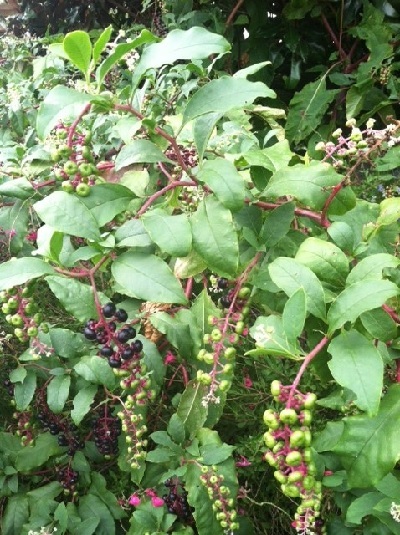 The berries are particularly poisonous to children. Although cooking apparently inactivates the toxins in young leaves, they can enter the body through the skin during harvesting. The young leaves, cooked properly, taste great and are good for you, but they shouldn’t be eaten unless the first boil water is poured off. None of the plant should ever be eaten raw.